Kohler, a global lifestyle brand, returns to Milan Design Week to host an enticing sensory experience inside the historic Palazzo Del Senato (via Senato, 10, 20121 Milan, Italy). The large-scale immersive exhibit showcases Kohler’s bold approach to design and the brand’s most stunning products through an artful combination of water, technology, texture, and color. The installation will be open April 9 through April 13 from 10am – 7pm daily. Nature plays a pivotal role with the inclusion of a “digital garden” at the entrance of the exhibit as well as an infinity garden that whimsically juxtaposes Kohler’s Smart Home collection. Kohler’s space also features a bar and lounge area for guests to relax and recharge. Additionally, Kohler will use the Palazzo as the platform for the launch of the company’s second global design theme, Experiential Luxury, an examination of the details and layers that create rich and dynamic environments. Products featured at this year’s exhibition include the latest from Kohler Co. brands KOHLER, KALLISTA, ANN SACKS and ROBERN. Media interested in a guided tour or to be included in media events at the exhibition are asked to contact the Kohler Public Relations team . Intelligent Toilets offer the perfect combination of sophisticated design and unmatched technology to deliver the finest in personal comfort and cleansing. Extensive customization – from ambient lighting and wireless music to temperature control, create a truly personalized experience. Digital Showering transforms users’ daily routine by allowing customization down to the tiniest detail. It invites users to orchestrate spray experiences, steam, music and lighting to create a personalized escape. Kohler’s portfolio of Smart Room products help create the world’s smartest bathrooms. With a full range of colors, Kohler finishes visually set the tone for any space’s story and convey a unique personality. 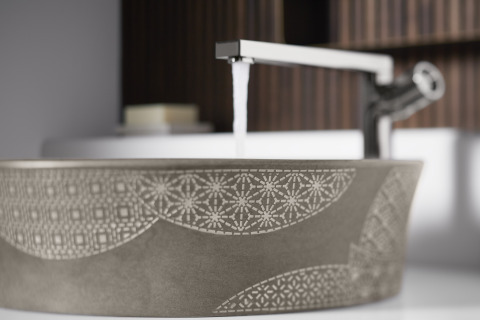 The Etch faucet finish – launching on the Components Collection – offers a beautiful, subtle gradient between two finishes with a precise graphic pattern. A wide range of colors and detailed graphics continue to draw the eye in for a beautiful, decorative impact. Steeped in Japanese culture, Kensho conveys the story of decorative stitching known as sashiko by using patterns etched in stone. It also leverages the Italian etching technique known as acqueforti, marrying metals and marbles to create a distinctive level of ornamentation. The shape is gorgeous, the real stone adds texture and variation, and the decorative techniques are stunning. With precise cuts and ultra-flat surfaces, the Parallel Collection of faucets and accessories brings sophistication to the modern bathroom through controlled expression. The dichotomy of round and square forms is unified by characteristic angles that deliver beautiful reflections and precise alignment. Smaller details deliver character originality and heighten the collection to a higher level of sophistication. In partnership with parent company, Kohler Co., ANN SACKS debuts The Crackle Collection by Kohler WasteLAB, an innovative tile series that employs Kohler’s unfired pottery cull as its medium, transforming the waste into a responsive tile body. Handcrafted in the WasteLAB located in the Kohler, Wis. enamel factory, the bespoke collection was one of the initiatives spun from the Kohler Innovation for Good program. Milan serves as the global launch of this collection as well as the premiere of a brand new colorway. Founded in 1873 and headquartered in Kohler, Wisconsin, Kohler Co. is one of America’s oldest and largest privately held companies comprised of nearly 37,000 associates. With more than 50 manufacturing locations worldwide, Kohler is a global leader in the design, innovation and manufacture of kitchen and bath products; engines and power systems; luxury cabinetry and tile; and owner/operator of two of the world’s finest five-star hospitality and golf resort destinations in Kohler, Wisconsin, and St. Andrews, Scotland. Kohler’s Whistling Straits golf course will host the 2020 Ryder Cup. For more details, please visit kohlercompany.com.